This is a recipe that's been long over due. 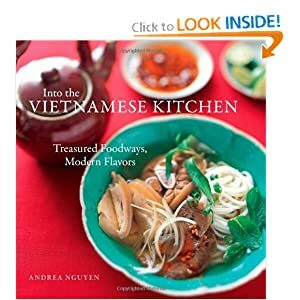 Ever since my book came out a year ago, I've been remiss that I couldn't fit in a recipe for the southern Vietnamese favorite, hu tieu Nam Vang noodle soup. It's a Cambodian-Chinese concoction that the Vietnamese 'borrowed' and then made their own. Nam Vang is the Viet word for Phnom Penh, and the southern part of Vietnam has deep Khmer roots. When you're in Saigon or elsewhere in the Mekong Delta region, there's bound to be hu tieu noodle soup. Compared to pho from the North, or bun bo Hue from the central region, hu tieu can be downright confusing because there are many versions of it. At its core, hu tieu (pronounced "hoo tee-u") signals a Chinese-Southeast Asian style noodle soup made with a pork bone broth and no fish sauce. But that's where simplicity ends. The noodles in a bowl of hu tieu can be chewy clear tapioca noodles, opaque white rice noodles like you'd use for pho noodle soup, or thin Chinese egg noodles (mi). The toppings cover a wide territory, and may include boneless pork, pork ribs, pork offal, shrimp, squid, wonton dumplings, fried garlic, fried shallot, and/or scallion. As usual, you pick and choose whatever you want. Hu tieu is the extreme have-it-your-way Vietnamese food experience. I've seen a 'dry' version too but have never tried it. Given all the variations, locking down a classic approach to hu tieu is difficult. There isn't one prevailing concept. Yep, Vietnamese cooking can be downright confusing. 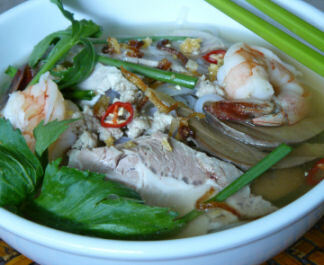 In fact, check this extensive Noodlepie blog posting on hu tieu noodle soup. If you read Vietnamese, peruse this hu tieu My Tho page on the Thanh Nien website. Note that they call out three versions of hu tieu -- hu tieu Nam Vang, hu tieu Tau (Chinese hu tieu) and hu tieu My Tho (from My Tho, the capital of Tien Giang province in the Mekong Delta that's famous for their rendition). For me, the definitive bowl of hu tieu noodle soup is hu tieu Nam Vang. The Phnom Penh version that I was introduced to as a kid by our family friend Uncle Su, a wonderful Chinese-Vietnamese cook, has a deep, umami-filled broth made of pork bones, dried squid and dried shrimp. 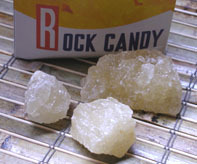 There's a touch of golden rock sugar to give it sweetness and to round out the flavors. The toppings are similarly a surf-and-turf combination of cooked pork, sliced pork liver, poached shrimp, sautéed ground pork, fried garlic and caramelized shallot. But wait, there's more! The essential garnishes are important here. Delectable hu tieu needs lots of pungent Chinese celery and Chinese chives (flat chives that have a slight garlicky bite); lettuce is also a common garnish but not my favorite for this noodle soup because there's enough to distract already and it doesn't add much. However, I'm a freak for the Chinese celery (can Tau), which pops its intense raw flavor in the soup. (Chinese celery looks like gigantic Italian parsley but tastes like strong celery.) When it's not readily available or not looking good at the Asian market, I substitute leafy celery tops, which is much stronger tasting than the fat ribs below. Most grocery stores have already trimmed that 'unwanted' portion of the celery plant, so hunt down a nice deep green bunch of celery at the farmers' market. Celery tops can be tough so you may have to halve them lengthwise. In the bowl above, I used celery tops. 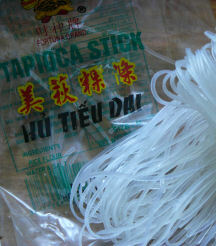 I also love using the chewy tapioca noodles for hu tieu. They're fat, chewy, and fun to slurp on. To find them, you'll have to head to a Vietnamese grocery store and look for packages of "Hu Tieu Dai" (chewy hu tieu noodles); despite what the label says, there's no rice in the noodles, but rather tapioca. These noodles are not commonly stocked at Chinese markets. On the other hand, a medium-width flat rice noodle that's like a fettucine or what you'd use for pad Thai works just fine. There are many steps here so take your time and know that one batch feeds many people. If you're hoarding it all to yourself, you can dole the bowls out over the course of 4 or 5 days. Just refrigerate the broth and toppings. Of course, you may also freeze the broth and meat toppings too. For the squid and shrimp, head to a Chinese or Vietnamese market and check the refrigerated section for the dried shrimp. Dried squid, sold whole in plastic packages, is often near the dried mushroom, snacks, or dried shrimp. 1/3 cup Crispy Caramelized Shallot (reserve the cooking oil for cooking the garlic) : "hành phi"
1. In a stockpot (about 12-quart capacity) over high heat, bring the bones and water to a boil. Use a large spoon or ladle to skim any scum that rises to the top. Add the remaining ingredients. Once the broth returns to a boil, lower the heat to simmer for 1 hour. At this point, the boneless pork meat should be slightly chewy but not tough. Press it and it should feel like the flesh at the base of your thumb. When it's cooked to your liking, use tongs to transfer it to a bowl of cold water. Let the meat soak for 10 minutes to prevent it from drying up and turning dark. Drain the meat and let it cool before refrigerating. Throughout this time, the broth should have continued to simmer. In total, the broth should simmer for 2 hours before it's done. 2. Strain the broth through a fine mesh strainer (or a coarse mesh strainer lined with cheesecloth) positioned over a large saucepan. 3. Use a ladle to skim as much fat from the top of the broth as you like. (Cool it and then refrigerate overnight to make this task easier; reheat before continuing.) Taste and adjust the flavor with additional salt and rock sugar. The broth should taste slightly too strong because the noodles and other ingredients are not salted. (Dilute with water if you've gone too far.) There should be about 4 quarts. 4. While the broth simmers, poach the liver. Fill a saucepan halfway with water and bring to a boil over medium heat. Add the liver and lower the heat to gently simmer for about 15 minutes, or until the liver feels firm, like the flesh at the base of your thumb. Remove from the water and put in a bowl of water for 10 minutes to prevent it from drying up and turning dark. Drain the liver and store with the cooked beef. 5. Prepare the Crispy Caramelized Shallots if you haven't already, reserving the cooking oil in the skillet. Add extra oil so that there's about 3 tablespoons total. Heat over medium-low heat and add the garlic. Gently sauté, stirring frequently, until golden. Use a slotted spoon to transfer the garlic to a ramekin or small bowl. Set aside to cool. 6. There should be a good 2 tablespoons of oil in the skillet. If not, add a little extra. Heat over medium heat and add the pork, salt and pepper, stirring to break the pork up into small pieces. Cook, stirring, for about 3 minutes, or until the pork is cooked through. Transfer to a ramekin or small bowl. Set aside to cool. All of these toppings may be prepared in advance and refrigerated. Return to room temperature before assembling the bowls. 7. Cut the pork and liver into thin slices, about 1/16 thick. For the best results, make sure they are cold. Have ready the shallot, garlic, ground pork, noodles, and shrimp for assembling the bowls. Arrange the garnishes on a plate or put them in small dishes and put on the table. 8. To ensure good timing, bring the broth to a simmer over medium heat while you are assembling the bowls. Add the shrimp and poach them for about 2 minutes, or until they have curled and turned orange. Remove from the broth and set aside. 9. At the same time, fill a large pot with water and bring to a rolling boil. For each bowl, place a portion of the noodles on a vertical-handle strainer (or mesh sieve) and dunk the noodles in the boiling water. As soon as they have collapsed and lost their stiffness (10 to 20 seconds), pull the strainer from the water, letting the water drain back into the pot. Empty the noodles into a bowl. 10. Top each bowl with sliced pork, liver and 2 shrimp. In the center add some cooked ground pork, fried garlic, and crispy caramelized shallot. Finish with a sprinkling of black pepper. 11. Raise the heat and bring the broth to a rolling boil. Do a final tasting and make any last-minute flavor adjustments. Ladle about 2 cups broth into each bowl, distributing the hot liquid evenly to warm all the ingredients. Serve immediately with the garnishes.